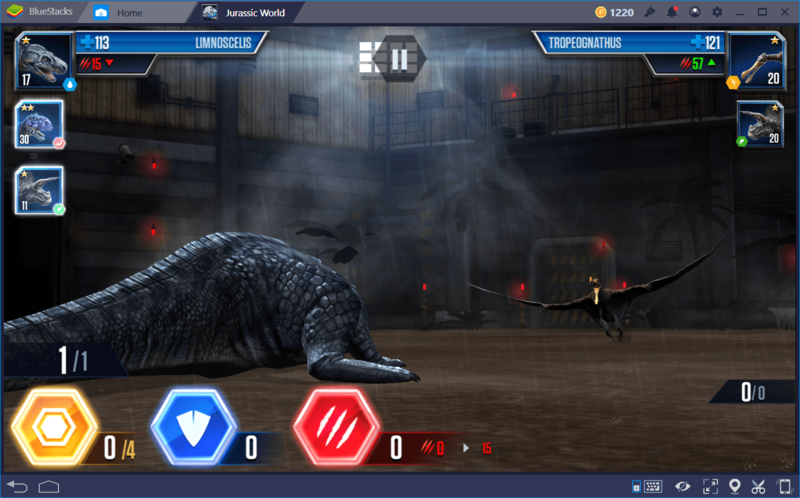 In contrast to most building sims, there is actually an additional layer of gameplay in the form of arena battles where your dinosaur exhibits can double up as prizefighters in combat against other specimens. In these matches, your dinosaurs face off against other creatures for honor, glory and, of course, the glorious, fantastic spoils. 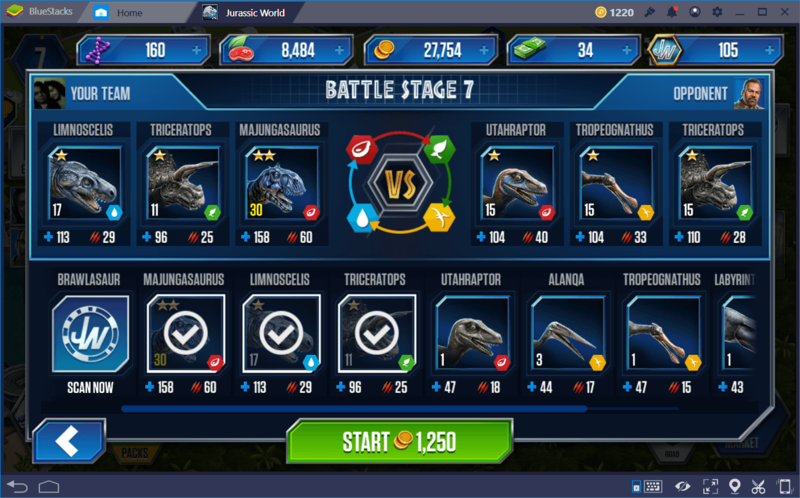 However, before getting your hands on the prize money, you need to actually win battles first, and to do that, you need to have good dinos. After all, does it really matter that you know the ins and outs of the battle system if you don’t have the firepower to back up your knowledge? In this guide, we won’t be teaching you how to fight nor how to defend yourselves in combat; that’s a subject we covered in the Battle Guide for Jurassic World. 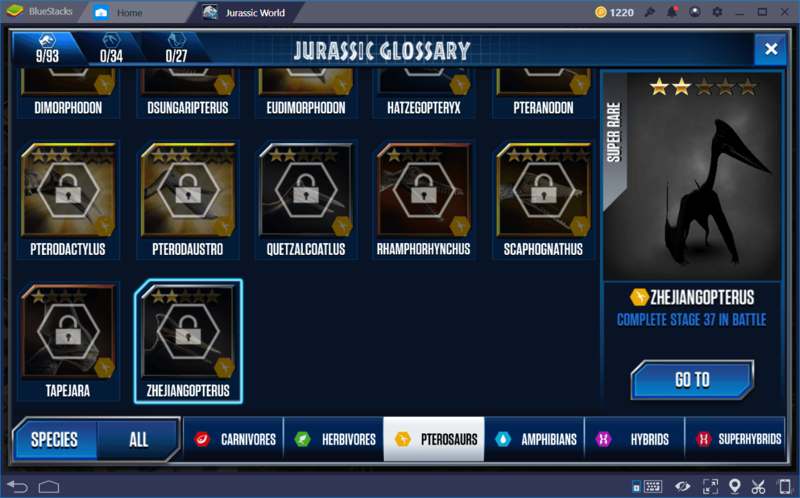 However, since there are many, many species of dinosaurs in this game, we figured that new players might get confused about which specimens to acquire first, and which to evolve to keep them relevant in the ring. For this purpose, we’re going to list some of the best creatures out there that’ll give you the best bang for your coin. Before getting into the list itself, we need to go over two important concepts that define all dinosaurs in this game: Rank, and Classes. There are 4 types of classes and ranks. For the former, we have carnivores, herbivores, pterosaurs, and amphibians. Each of these classes has an advantage over the others, which is what we at BlueStacks call the circle of advantages: carnivores beat herbivores; herbivores beat pterosaurs; pterosaurs beat amphibians; amphibians beat carnivores. These type advantages are very important, as dinosaurs who have an advantage over other types will deal 50 percent more damage to them, and receive 50 percent less. Exploiting these weaknesses are key in obtaining victory in battle. When it comes to ranks, there are also 4 types, which define the quality of any given dino. These ranks are divided into Common, Rare, Super Rare, and Legendary dinos. As their names suggest, each rank is increasingly better than the last, with Commons being the weakest, and Legendaries being the strongest specimens. However, the strength of these dinos come at a cost, with higher ranks costing more DNA and food to hatch, combine, and level up. 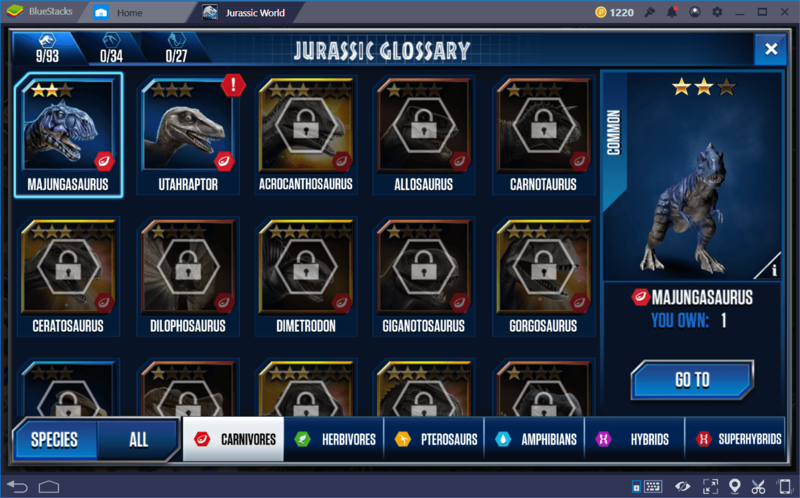 In this sense, while you’ll be forced to acquire some legendary dinos somewhere down the line in story missions, we found that super rares give the most bang for your buck in terms of performance. These are about 75 percent as strong as legendaries, but cost about half in food and DNA to properly raise. That being said, a properly raised Super Rare dino in each class should easily get you through every single story and tournament match the game has to offer. For this reason, our list will contain mostly super rares that, in our opinion, could give the player a great advantage in the field. This common-rank carnivore dinosaur roamed the Earth about 70 to 66 million years ago, at the end of the Cretaceous period. It is the sole species in the abelisaurid theropod genus, which makes literally one-of-a-kind. 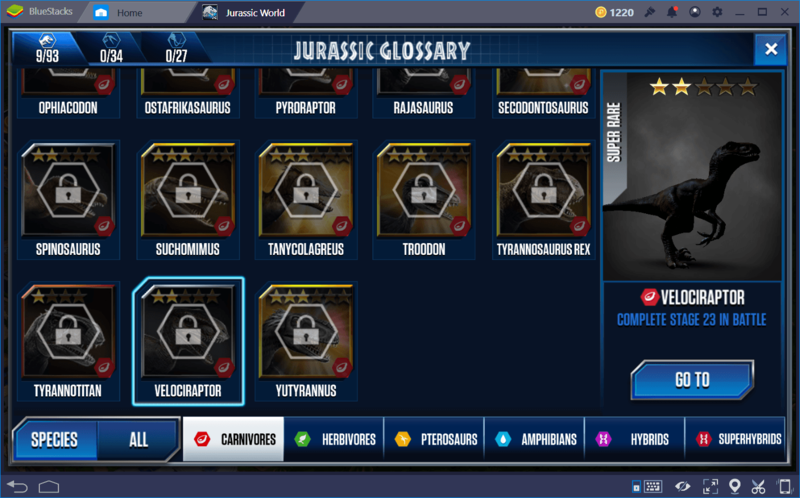 The Majungasaurus can be unlocked very early in the game, and can easily take you through the first 9 combat stages. Not by itself, mind you. In the hardest stages, it might need some help from a meat shield to take the first blows while gathering points, so Majungasaurus can jump in and tear apart the enemy team with a single hit. Be sure to level it as much as you can early on. Focus on this dino, as it is strong enough to take you far into the game. This dinosaur costs 110 DNA to hatch and can provide 3,457 coins every 3 hours at level 30. Jumping straight into Super Rares, the Velociraptor is the first carnivore that you’ll unlock in this rank. It is a medium-sized, very fast dino that lived approximately 75 to 71 million years ago, during the Cretaceous period. This dinosaur is known for its pack mentality, roaming in groups of several of its kind, with a single male known as the Alpha Raptor. They have strong legs, which are tipped with razor sharp claws, which they use to rip and tear their prey. In Jurassic World: The Game, the Velociraptor is the best Super Rare carnivore. It’s all you’ll need to get you by until you have ample resources to begin building your team of Legendaries. It can be unlocked after defeating Battle Stage 23. It costs 1,500 DNA to hatch and can be fused with the T-Rex to create the fearsome Indominus Rex, the same one from the Jurassic World movie. Awesome! The first herbivore on the list and, by far, the best among the rest. The Ankylosaurus is a strong herbivore, and the third Super Rare creature to be unlocked in the game. Like the other two species mentioned above, the Ankylo lived near the end of the Cretaceous period, some 68 to 66 million years ago. 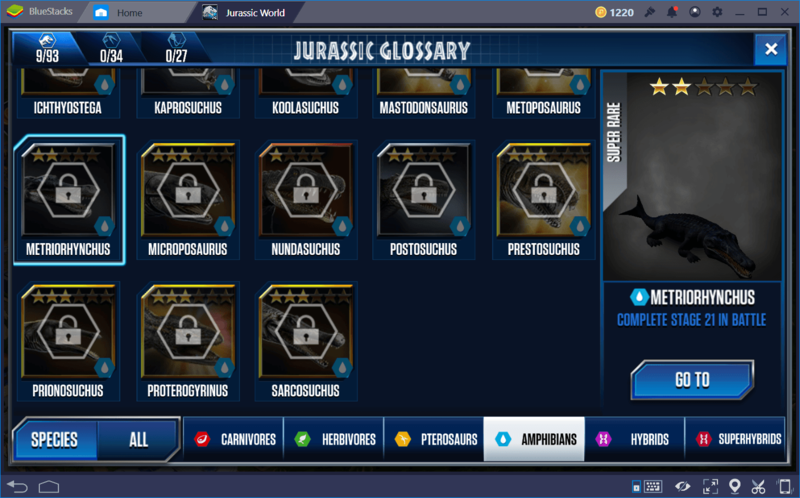 These dinos are all you’ll need to make short work of any pterosaur in the game, and you should level them as much as you can as soon as you get one. 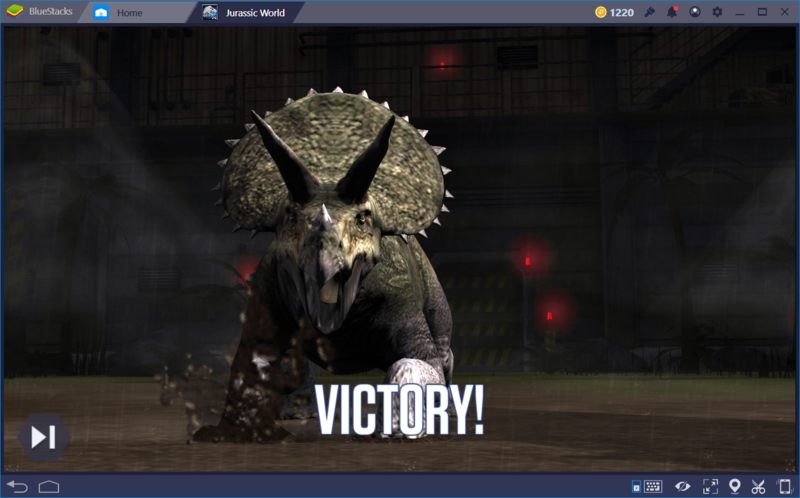 The Ankylosaurus should always be a starter in your team when it comes to single-player matches, as it can help you absorb some blows and set the field for the stronger dinos. It can also completely wreck any pterosaurs they come up against, so be sure to deploy one if you’re fighting against one of these winged pests. It costs 1,200 DNA to hatch an Ankylosaurus, and they are unlocked by beating Battle Stage 20. This unbecoming pterosaur is the best Super Rare dinosaur of its class. It got its name from the group of Chinese paleontologists who first discovered its fossils back in 1994. It was reported to live in what is now China during the late Cretaceous period. We’re not too big on pterosaurs; we simply don’t like the design. However, there is simply no better way to deal with amphibians than with a reliable pterosaur on your team. This is where the Zhejiangopterus comes in. However, it’s unlocked fairly late into the game — after beating Battle Stage 37, so you might need to have other dinos to fill his spot until then. After you unlock this Super Rare dino, though, you’ll want to level it as much as you can. Hatching this dino will set you back 1,100 DNA. Last, but not least, the best Amphibian in the game, at least until you reach legendaries. The Metriorhynchus is a crocodile-like dinosaur that roamed the oceans during the mid to late Jurassic period. It was named by German paleontologist Christian von Meyer, who discovered the creature’s fossils in 1830. You basically can’t go wrong with this dinosaur, especially because it’s the only Super Rare amphibian in the entire game, which means that you’ll be using it for a long time after unlocking it. Be sure to level it to the max, and to always deploy it against carnivores, which they can easily defeat. This dino costs 1,400 DNA to hatch. These are our top 5 picks for best dinos in the game. 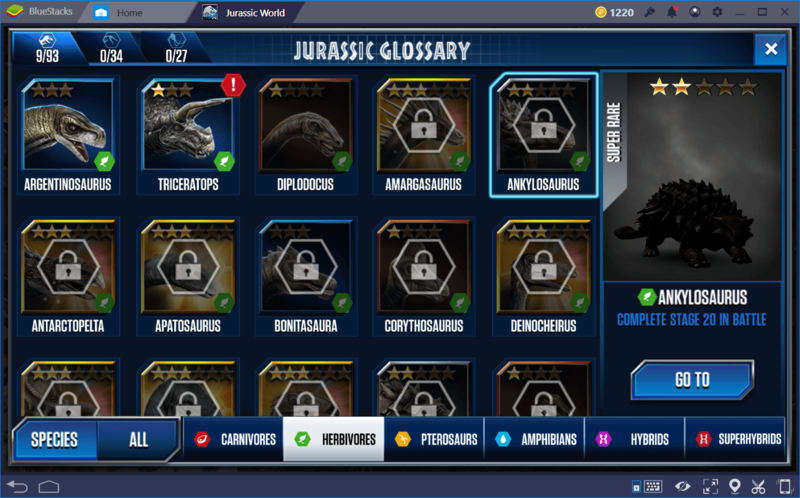 Keep in mind that, while we listed a common dinosaur as the first entry, this is only because of its usefulness in the early game since it can help you to progress through the first 10 Battle Stages. Other than that, you’re better off replacing him for when you unlock better carnivores. Keep in mind that you can sell your unused specimens for DNA, which you can then use to hatch bigger and badder dinosaurs. Are there others dinosaurs that you think should be in this list? Feel free to let us know in the comments below!